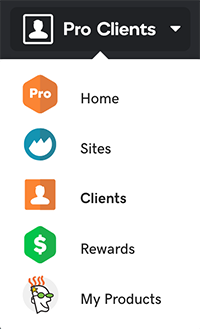 As a GoDaddy Pro member, you can add a Pro badge to your site to show clients that you’re a member of the program. The badge links back to your profile page so clients can see your portfolio, reviews, and more. Click Pro Clients and select Rewards. In the Rewards page, click Badges. Copy the embed code and insert it into the HTML code on your page where you want the badge to display.